← How to Plant (design) a garden. Mass versus Specimen planting. 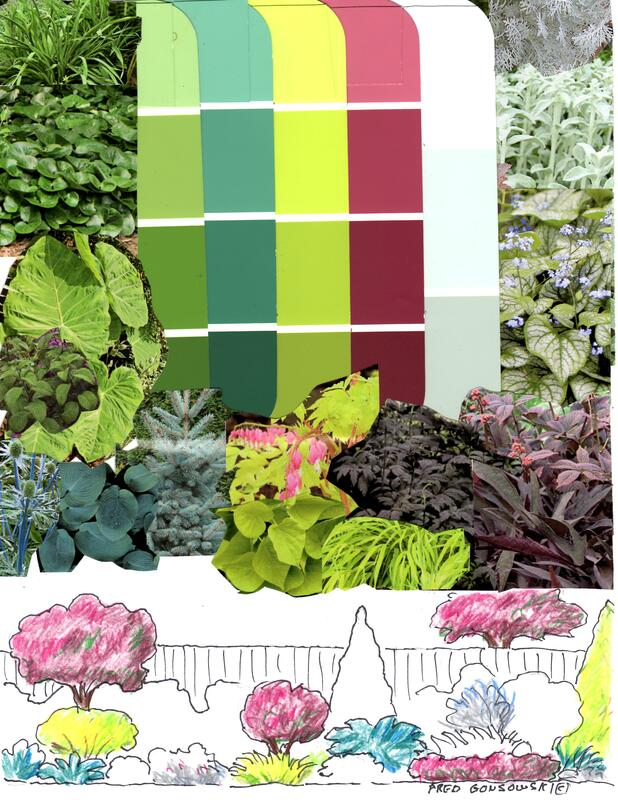 Green, Blue-Green, Chartreuse, Burgundy and Gray foliage. My garden, here at Whimsey Hill House starts blooming in April, is a wonderful sight throughout the summer, and is done blooming, cut back, and run over with the lawn mower by the middle-end of October. I have perennials and annuals that, basically, throughout the growing season, give quite a display. Most perennials bloom two to three weeks, and before they bloom, and after they bloom, you really only have their stems and foliage to look at. What a herbaceous perennial garden really is, is a tapestry of leaves. If you want to heighten the look of your leaf tapestry, to take it past just a sea of green foliage, with flowers, ADDING colored foliage to your garden will give it that WOW FACTOR. The colors of foliage I am telling you about are Blue-Green, Chartreuse, Burgundy, and Gray. The names for the four colors I came up with are just quick and simple descriptions for a broad range of foliage tones. Blue-Green is self-explanatory. It could also be green with a hint of blue, blue with a hint of green. It could be pale and frosty, or a deep somewhat jewel color. Chartreuse is yellow-green, harvest gold, gold with a hint of green, and green with a good amount of yellow in it. Burgundy is reddish-purple. burgundy-maroon, burgundy with black undertones, burgundy with dark green undertones…also any foliage that has red in it. Besides the colors I just listed, I am starting to see, in my area of upstate New York, a new color of foliage. It is a Coppery-Honey-Rust color. It almost looks like a Maple leaf in Autumn. Now look at the illustration. The upper part shows some examples of the colors I am talking about. I used paint chips, and magazine cutouts to give you an idea of what to look for. Next look at the illustration of the garden. The concept that I want to relate to you here, is about working the different colors of foliage across a garden and even around your property. First look at how I took the burgundy color of the foliage and worked it from the small tree on the left side of the drawing, to the bush in the center of the garden. Then it shows up again at the edge of the border and finally it appears as the color of the tree in the neighbor’s garden. Now look at how I worked the chartreuse across the garden, from the bush on the left, to the planting along the garden’s edge, to the pyramidal bush on the right. After that look at how I worked the colors gray and blue-green across the border. The secret of adding different colors of foliage is to NOT plant it in one place (isolate it). You must find places on your property to move the color along. If you plant it in one place and stop, your eye will go right to it. If you plant it in multiple places, the eye will keep moving from one planting of it to the next. The purpose of adding different colors of foliage to a garden, or your property, is that the foliage color alone is visually interesting, even if no flowers are blooming. 5 Responses to Colored Foliage adds that WOW FACTOR to a garden! Enjoyed the foliage color lesson. It will be especially useful as I think ahead to spring and start selecting some plants for my very shady back yard. Also love the name of your house…I named my house, too…it’s called Timberwyck Corner. Perhaps you’ll share some tips for maintaining a shade garden. Thank you Joanne for your comment. Timberwyck Corners, has a ROMANTIC sound to it. I will be covering the shade garden, in the coming weeks. Read my post, on the shapes of leaves. The Shade Garden is all about Leaf shape, and foliage color. Flowers can be a part of it, as long as there is some light. You know what….When I get the interior decorating basics done, that I am working on now, I will think of ways to address your topic. This blog has become an UNFOLDING of ideas for me. Wow I love your posts, I can not sleep tonight , so I getting more excited about garden design reading your posts. So much great information. I once met a lady buying garden supplies at the store, and she said she had big flood lights installed so she could do her gardening at night when sleep would not come…. hum it is tempting. I can think of so many ways to make my garden ssooo much more beautiful. It is good to know I am not the only one that analyzes the shapes of all the glass jars I buy so I can display flowers in them. One of my favorite things to do is line my window sill with tall thin vases and put a white daisy in each one. My grand kids love to watch them turn colors with food coloring added to the water. Thank you for sharing so much great knowledge! Hi there LaNae, thanks your your comment. I wish you mentioned the lining up of the thin vases and putting dasies in them, under the post Start a collection of Small Glass Bottles… That way a reader of that post would also be inspired by your suggestion. If you have not already, look at the Categories on the right side of the screen. I have the posts divided by topic areas, and it might help you find articles on certain things that might interest you. Oh Boy—Now that you ve helped me SO MUCH with my homes interior I can now go to you for Gardening help!! You are AMAZING!! !